Looking for paint disposal services in Las Vegas? Logistical Solutions is a full-service hazardous waste management company offering a wide range of environmental cleanup and paint disposal services. Unused paint is hazardous and cannot be disposed of in the trash or recycling bins. We offer professional and safe industrial paint removal services. Paints may be oil or latex based and contain dangerous chemicals including lead which can damage the environment and affect the water supply if not disposed of properly. Latex paint may also contain mercury, which can cause health issues. 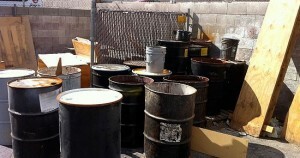 Contact us for a free consultation regarding paint disposal services in Las Vegas, NV.